After this amusing and intentionally silly bit of wonderful hokum, Eramus introduces the first tale, that of “The Shadmock.” In it, a couple of grifters (Simon Ward and Barbara Kellerman) plot their next hustle, with Kellerman answering the call to be a housekeeper at a looming manor owned by a gentle recluse (James Laurenson). Initially repulsed by the man (he looks like a pasty riff on legendary horror host Zacherle, who in turn looked like Lon Chaney in Phantom of the Opera), she sticks around in hopes of ripping the poor fiend off. Problem is, the gent is actually a Shadmock, a monster who can kill and maim by whistling (shades of the 1978 movie The Shout). After Kellerman agrees to marry the man, he throws a party in her honor and invites his eerily masked relatives. And then things get scary. This is a fine, disturbing tragedy and Laurenson sells it with his sympathetic portrayal and the final scene is rather disturbing. As a kid, years before I saw the film, I had a comic book reprinting some John Bolton drawn comic adaptions from this film and others and The Shadmock was in there. It scared the hell out of me then and the film itself is almost as jittery. Next up is “The Vampires,” a goofy but atmospheric and delightful tale about a vampire patriarch (Zombie‘s Richard Johnson) and his loving wife (the gorgeous Brit Eklund) and their poor little boy, who is bullied daily. The kid is befriended by a kindly vicar (Pleasence, clearly having a blast) who offers to walk the lad home. Thing is, Pleasence is actually the head of a secret cabal of vampire killers assigned to murder the boy’s undead pop. Once they break into the basement crypt to do just that, much silliness ensues. But unlike some of the camp in Baker’s The Vault of Horror, this segment is long, eccentric and beautifully-produced with some great Eastern European-tinted music and a warm, sweet final sting. Not scary, but a total delight. 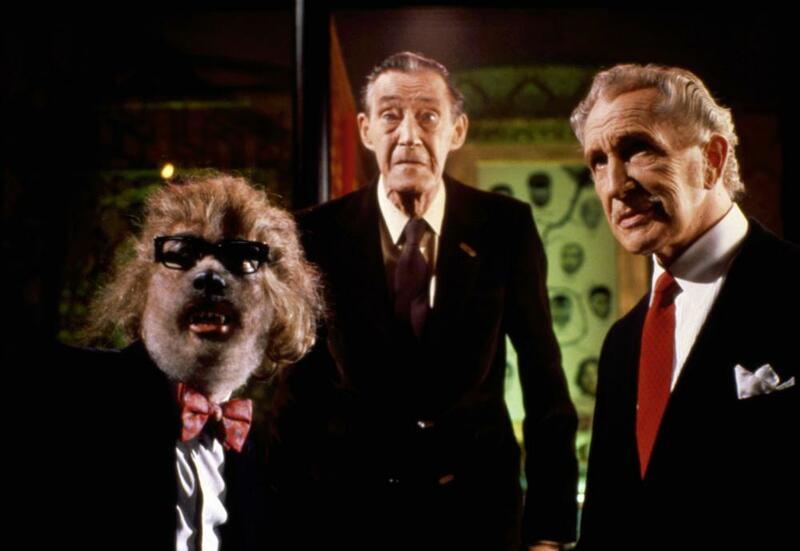 The final story, “The Ghouls,” is not only the scariest tale of the lot, it’s one of the creepiest damned things I’ve seen in any British horror movie and I would love to see just this story get a feature remake. In it, Stuart Whitman plays a hot-sh*t American director who ventures into the British countryside to scout locations and winds up in a ruined abbey, where he meets the always spooky looking Patrick Magee. Magee is the leader of a group of ashen, leering creeps dressed in filthy robes and with murder on their minds. They overtake Whitman and imprison him in a locked room where he is brought food by Magee’s daughter. She informs the terrified filmmaker that she is a “humgoo,” born of human and ghoul and that her “family” are a species of ghouls that invaded the village, mated with the women and ate the men and then proceeded to eat the dead. In a nightmarish animated sequence, we see this gruesome history unspool, with the girl explaining that they get their wood and food from the “boxes” in the ground and now… there’s no more boxes in the ground. I won’t say more about this story but honestly, it’s one of the most unsettling little slices of shock to seep out of the Amicus cannon. 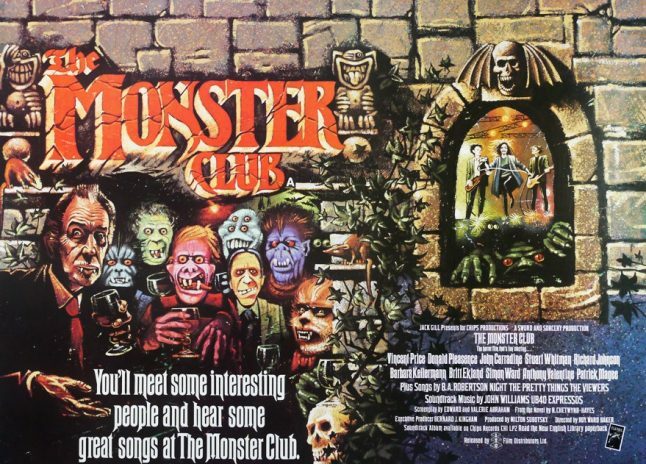 There’s so much to adore about The Monster Club. Baker was often a restrained director who always seemed a bit too “classy” for some of Hammer’s more lurid material (The Vampire Lovers and The Legend of the Seven Golden Vampires, for example) but he really goes for it here, having fun with the giddy framing material and really letting loose with the stories themselves. He’s aided by a superlative cast, handsome production values, great Chetwynd-Hayes source material (though apparently the author wasn’t very pleased with the film) and an amazing musical score by Amicus regular Douglas Gamley with John Williams (not THAT John Williams) on acoustic guitar (the same John Williams also played the haunting “Cavatina” piece from The Deer Hunter). Said score is lovely when in symphonic mode and horrifying when it veers into pure electronic evil, as in “The Ghouls” story.